Most reviews on this site cover music from mainstream (i.e. Hollywood) movies or games, but every now and then a score for an European production comes our way. 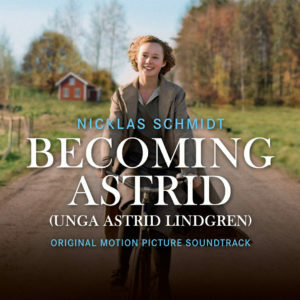 A nice example from one year ago was Passage to Dawn by Diego Navarro, and this time I had the pleasure to listen to the score of Becoming Astrid, with its original title Unga Astrid Lindgren, composed by Nicklas Schmidt. Surely, most of you know, Astrid Lindgren, who was a very famous writer of children’s books like Pippi Longstocking. The movie is about Lindgren herself as a person and not about her colorful stories, which is reflected in the music. When I think about Lindgren the music from Pippi’s famous song pops up in my head, but the score does not contain any themes or leitmotifs and was purely written to be supportive of the things happening on the screen. For the music Schmidt did not use a lot of instruments. Most of the music was performed by a small group of strings, supported in some tracks by a piano, harp, mallets or organ. Overall, it is hard for me to highlight single tracks from this album, since each track is very unique in its melody most of the time. When I listen to a score I try to pick out moments of happiness or sadness, but in this one, most of these emotions are not really present, but we can listen to beautiful melodies instead. I suggest that if you are curious about this score, to listen to the first track “Old Astrid.” If you can enjoy the beautiful piano and strings in this cue, you will probably like the rest of the score as well. For a score without any clear themes and leitmotifs, the different melodies and sounds make sure that the listening experience stays interesting and refreshing. Most of the tracks are beautiful to listen to separately, and with that, the whole score becomes a true gem. It shows that there is a lot of scores to discover next to the big Hollywood blockbusters.